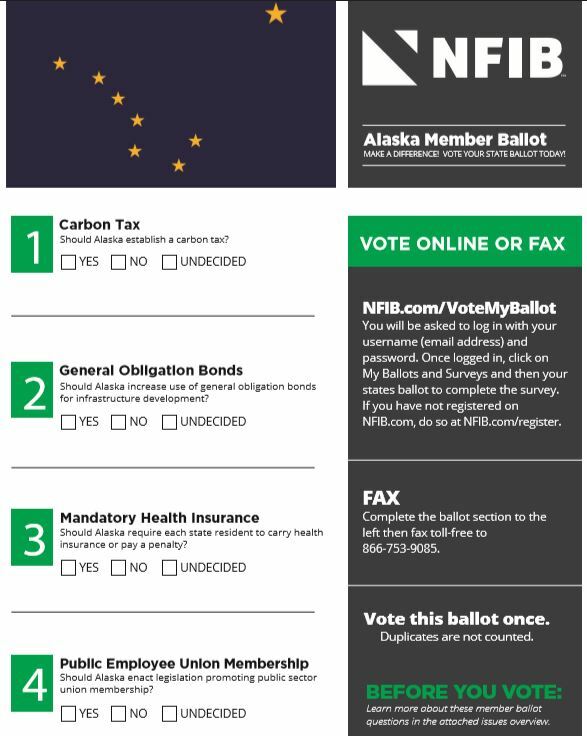 NFIB thanks its Alaska members who took the time to vote their state ballot. Other associations poll their members but NFIB is the only one which centers its lobbying positions, both in Juneau and in Washington D.C., on what its members tell it through annual surveys are their concerns. The 2019 Alaska State Member Ballot asked four questions. Should Alaska establish a carbon tax? Should Alaska increase use of general obligation bonds for infrastructure development? Should Alaska require each state resident to carry health insurance or pay a penalty? Should Alaska enact legislation promoting public sector membership?